America needs more than tough talk to maintain its influence: The next president needs to reinvigorate America’s place in the world. It will take more than speeches and tough talk. 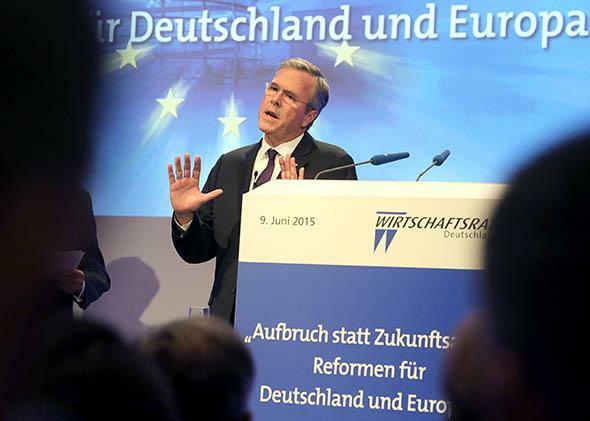 Words, words, words: Jeb Bush gives a speech in Berlin on June 9, 2015. LONDON—Several times lately—often enough for it to have become a distinct pattern—I’ve found myself part of a heated discussion, somewhere in Europe. Maybe it’s at a dinner, or a conference; maybe the topic is Russia, Libya, or the economic crisis in Greece. But at some point, someone looks up in wonder. “Isn’t it odd: We haven’t mentioned the United States once!” Yes, everyone agrees, it’s odd! And then the subject changes again. Few here doubt that American influence in Europe is shrinking, along with American engagement in the world, though the explanations differ. Some date the decline quite precisely, to the Iraq war in 2003 and to the Bush administration that launched it. That was the moment when Europe divided over whether to support the United States; worse, those who did paid a high price afterward. Certainly Tony Blair never quite recovered from his decision to join the invasion, and Britain’s newly reluctant foreign policy is partly a product of the war , too. Others blame the current administration, with equally good cause. President Obama’s failure to defend his own “red line” in Syria and his admitted lack of strategy against ISIS have left many wondering whether he’s interested in the Middle East at all. The same problem exists with regard to Russia, where there is a strange split between NATO military leaders, who are publicly very blunt in their assessment of Russian maneuvers over the Baltic Sea and Scandinavia, as well as in Ukraine, and the strangely sanguine White House. While Gen. Philip M. Breedlove, the supreme allied commander for Europe, warns of “revanchist Russia,” Obama lightly dismisses Russia as a weak “regional power” that poses no larger threats. Nature abhors a vacuum—and for the dozen-odd people seeking to become the next U.S. president, American drift and indecision look like easy targets. Certainly Republicans have identified foreign policy as a winning issue. While in Germany this week, Jeb Bush described Russian President Vladimir Putin as “a ruthless pragmatist who will push until someone pushes back” and called for a renewal of the Western alliance. Sen. Marco Rubio has also demanded renewed “American strength” and greater global leadership. It’s probably only a matter of time before Hillary Clinton finds a way to delicately separate Obama’s first term from his second, the better to attack the latter as well. Which is all very well, except that no “statement of resolve,” however fierce, is going to fix the problem. It’s easy enough to sound tougher, but the real task for the next president is not merely rhetorical. If he or she truly wants the United States to lead the West again, any future president—or indeed the current one, since he’s got more than a year left to go—needs to launch a radical reform of the alliance itself, as well as the institutions of the alliance, to address the legacies of both Bush and Obama. This isn’t 1979, and a revival of Reaganism isn’t going to work: America’s allies are as wary of American belligerence as they are of American indecision. NATO is the obvious place to make a new start. The alliance needs a streamlined decision-making process, as well as a stronger commitment to the threatened states in the East—but the challenges facing the West aren’t just military. We also need new institutions to fight new kinds of threats. During the next decade, the United States should lead a broader conversation about the vast and growing challenges from foreign computer espionage, which is entering new levels of sophistication, as well as peddlers of disinformation from Russia, China, and elsewhere who have become far more adept at influencing our own political debates, and in sowing chaos. Equally, America needs allies in the Western struggle against international corruption, which is undermining the political independence of many weaker Western states. The Justice Department’s dismembering of FIFA made an interesting case study: Why not apply the same energy and thoroughness to the money-laundering operations that have enriched so many oligarchs all over the world—as well as their Western partners? I can see that this is a problem for your average candidate: reforming and reinforcing NATO, building institutions to fight transnational corruption and cyberthreats—none of these things sounds as good on the campaign trail as “Let’s make American great again.” But if the next president is serious about making the United States a plausible leader again, then America needs to launch some new projects with its old friends, reinvigorating the Western alliance for a new era in reality. Rhetoric alone won’t do it.